My name is Sara and I'm a sophomore in college. I love listening to people and helping them work through and problems that may be occurring. I am happiest when I am helping someone else because I feel like I am truly accomplishing good. In my spare time I love reading novels and dancing. The beach is my favorite place in the world and I love the smell of lilacs. Growing up in a family of six, I am very close to my parents and three sisters. Together, the five of them make up part of my "family" which is the most important thing in my life. While I would put my parents and siblings before anything and anyone else, there is more to my "family" than those who are blood related to me. I believe that in a way, a person can choose their family. I get to choose the group of people who I share everything with, rely on completely, and would die for without any question. For me, this group of people consists of both my biological family, as well as my closest friends. I tend to be the type of person who tries to take on everyone else's problems to make their lives that much easier. When other people care enough about me that they realize I can't do it all on my own, and take on some of my problems, I know that they love me enough to be considered my family. Although we may not all live under one roof and have the same "head of the house" - as the dictionary defines the term - these people help make me who I am and can never be replaced. 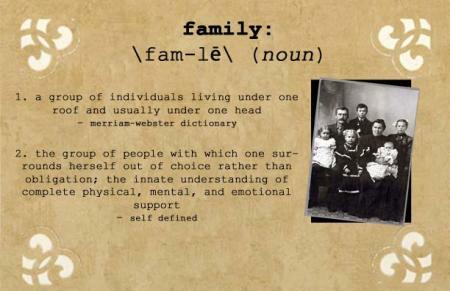 For those reasons, my "family" is the most important thing to me.